Wow! This post is way late, but whatevs. Marshall and I left early Sunday Morning September 13th to race the Black Bear Rampage at the Ocoee Whitewater Center in Tennessee. The drive took about 3 hours and we arrived about an hour and a half before the start of the race. Really nice to roll up and see some familiar single speed faces, 29er crew folks as well as some good Asheville buddies. 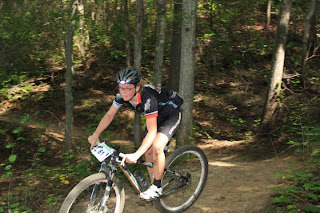 The Black Bear Rampage was on a really cool course with lots of climbing and lots of twisty sandy riding. Some bits were real technical and I loved riding beside the river that I spent two summers raft guiding and kayaking on. I had never been on these trails even with the amount of time I spent here. The race was hard. I chose to run a 33X20 and when we reached the steep climbing bits that we had already descended, I was regretting my choice as I got off and walked. I kept up with Ursula for about the first 15 miles, passed her on a technical rooty section, and then she passed me on a climb never to be seen again. That 50-year-old lady is FAST! I also met a nice lady named Rachel who also raced in the women’s single speed class. Whew, we were lucky. 3 ladies make a class. I placed second. Pretty cool. Something to look forward to next time. 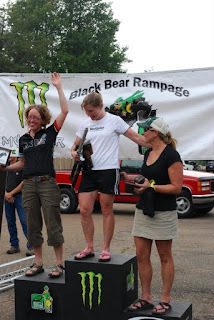 Hopefully the Black Bear Rampage will continue to get more single speed women and therefore more competitors. Nothing like racing single speed mountain bikes with other single speed ladies! Thanks to the 29er crew for hooking me up with a spot! It was awesome!